There's an old apple orchard in North Carolina overlooking the Blue Ridge Mountains. The orchard is covered with ancient elegantly shaped trees. For some reason, they remind me of dancers forever frozen in midst of an enchanted performance. The trees are beautiful. To see them portrayed in infrared light is just magical, taking on another dimension of reality. Photographed in color, the tree doesn't tell the same story. 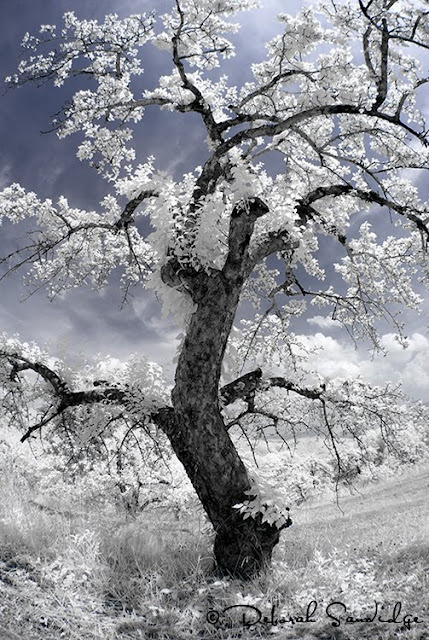 Infrared photography isn't as daunting as it was with film. The camera I used was converted to photograph in infrared, using a standard R72 type filter. The camera was handheld with a normal exposure time. I used a fisheye lens to enhance the surreal quality of the image. No film, chemicals or darkroom needed.